The Winner of National Junior Baking Competition, Éabha Campbell, has recently starting selling her 1916 themed muffins in Aldi stores nationwide. 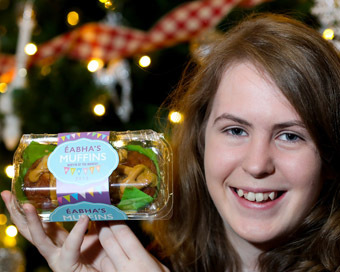 Foróige teen Éabha has had her ‘Muffin of the Moment’ stocked in 128 Aldi Stores and is their youngest supplier at just 16 years of age. Éabha, from Truagh Foróige Club in Co. Monaghan, was crowned the National Junior Baker in the Aldi Marquee at the National Ploughing Championships back in September and the opportunity to have her muffins stocked in store in Aldi nationwide was part of her prize. Éabha baked spiced fruit centenary muffins which the judges described as outstanding. The muffins are based on a traditional gur cake recipe which was sold on the streets of Dublin in 1916. The National Junior Baking Competition, which is sponsored by Aldi in association with Foróige and the National Ploughing Association is in its second year. Foróige CEO, Seán Campbell said “Empowering young people to find their passion, embrace their talents and reach their individual potential is what Foróige is all about.” And we totally agree here at WMB. Well done Éabha!